Q. Program to determine whether all leaves are at same level. In this program, we need to check whether all the leaves of the given binary tree are at same level or not. A Node is said to be leaf if it doesn't have any child node. In the below diagram, nodes 4, 5 and 6 are leaf nodes as they don't have any child node. 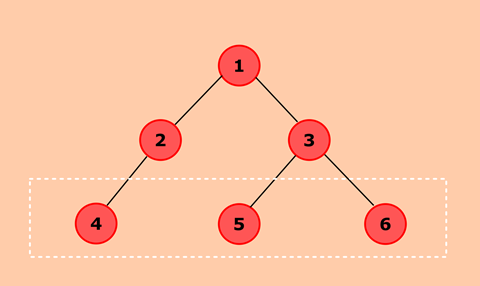 Nodes 4, 5 and 6 are present at the same level, i.e., Level 2. Define another class which has two attribute root and level. The level will be used to store the level of the first encountered leaf node. If the tree is not empty, traverse through the tree and check for leaf node whose left and right children are null. CurrentLevel will keep track of current level being traversed. When the first leaf node is encountered, store the value of currentLevel in variable level. Traverse recursively through all level, check for subsequent leaf nodes. If currentLevel of all leaf is equal to the value stored in level then, all leaves are at same level.